Vassilis Gerodimos is professor of Training & Physical Conditioning in the Department of Physical Education and Sport Science at the University of Thessaly, Greece. He received his BSc in Sports Science (1994) and his PhD in Physical Performance and Health (2002) from the Aristotle University of Thessaloniki, Greece.He has worked (1999-2003) as a part time lecturer in the Department of Physical Education and Sports Science at the Aristotle University of Thessaloniki teaching courses related to Training and Coaching. Since 2003, Dr. Gerodimos is a faculty member at the Department of Physical Education and Sports Science at the University of Thessaly teaching undergraduate and postgraduate courses related to physical conditioning and evaluation in health and sports. He has published 7 books-chapters in books and more than 60 peer reviewed papers in International and Greek journals, and has presented more than 100 papers in international conferences in the areas of physical conditioning, team sports, evaluation and health. His work has been internationally recognized and has been cited by more than 1.000 other authors. 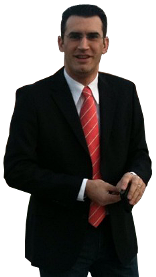 He serves as a reviewer for several journals in the sports science field.As a principal investigator he has secured more than 600.000€, the last four years, from 6 research grants. He has also participated in more than 15 research grants. His research interests include muscular adaptations to exercise, exercise testing and prescription in health and sports, vibration training, isometric and isokinetic evaluation. He is also an experienced coach of physical conditioning in basketball, and he has worked in many elite basketball teams in Greece and Poland. Exercise Testing and Prescription for promotion of health. Physical Conditioning and Evaluation in Sports. Gerodimos, V., Karatrantou, K., et al. (2017). "Static and dynamic handgrip strength endurance: Test-retest reproducibility". J Hand Surg Am Vol, 42:175-184. Karatrantou, K., Gerodimos, V., et al. (2017). "Health-promoting effects of serial vs. integrated combined strength and aerobic training". Int J Sports Med, 38:55-64. Dipla, K., Kousoula, D., et al. (2016). "Exaggerated haemodynamic and neural responses to involuntary contractions induced by whole-body vibration in normotensive obese versus lean women". Exper Physiol, 101:717-730. The primary focus of the "exerciseforhealth" site, is to promote exercise as an intervention strategy for prevention and rehabilitation of chronic diseases. The primary focus of the "healthykids" site, is to provide information and education on the importance of exercise and nutrition for the promotion of health. The official site of the Training and Physical Conditioning Laboratory of the Center of Research and Evaluation of Human Performance. D.P.E.S.S., University of Thessaly.